The bellows is made up of over 300 pieces of leather, linen, and cardstock. The leather that covers the outside of the bellows is a high quality bookbinder’s goatskin with an embossed ‘cross hatch’ texture similar to that found on vintage Wheatstone and Lachenal bellows. 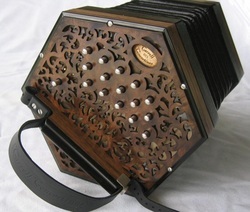 The bellows are available in solid black or with decorative papers.